Early childhood music is defined as music for students ages zero to eight. This page will assist music educators with resources that they can utilize in their early childhood music programs. In addition, this page will also list early childhood music professional development events that will occur in the future. Exciting Opportunities for NJMEA Elementary Music Educators! Webinars for Elementary Music Educators! Earn PD in your PJS! If you are a NJMEA member, you can earn 2 PD credits for participating in this webinar. To earn the credits, you need to send me a summary of the ten tools and to answer the following the question at the end of the webinar. You can submit it to me here. 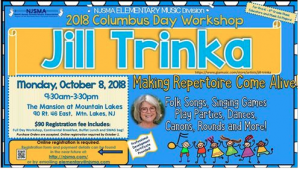 NJSMA Elementary Division proudly presents internationally renowned clinician, JILL TRINKA, at the Columbus Day Workshop (10/08/18). Registration is now open! Denise Gagne’s Series (http://denisegagne.com/?page_id=13) – Denise has a plethora of materials from Sing and Play on Special Days to Alphabet Action Songs to Musicplay. All of these materials can be successfully used in PreK. They have a Facebook page here! John M. Feierabend’s First Steps in Music Series (http://www.giamusic.com/products/P-5880.cfm) – Feierabend is one of the music education leaders and this series is excellent because he gives you books about songs and movement activities, uses repertoire based on folk or traditional songs and poems, gives you lesson plans and suggestions for setting up and class and preparing parents, and includes a nice classical component. Join their Facebook page to learn more! (https://musiced.nafme.org/about/position-statements/early-childhood-education/) – This position will assist you when advocating music education for your school’s PreK program. Pinterest (http://www.pinterest.com/doremigirl/preschool-early-elementary-music/) – When you input “preschool early elementary music” in the pinterest search bar, you will find numerous pins to explore. (http://www.teacherspayteachers.com/Browse/Search:PreK+music) – When you input “PreK music” in the search bar, over 200 results appear. The Little Beethovens (http://www.thelittlebeethovens.com/) – There are some great ideas for PreK music lessons on this site.